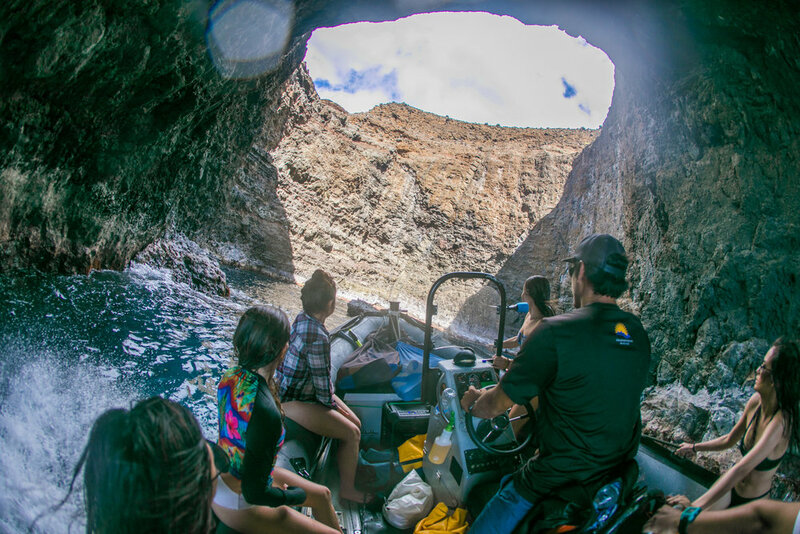 Blue Ocean Adventure Tours is committed to providing a safe, friendly adventure that allows the individual to experience the beauty of the Napali coast and the rich and amazing sea life. Customer satisfaction is the measure of our success! Born and raised on Kauai, ocean life has always been a genuine and natural passion for Cody. Since the age of 10 when he began freediving, fishing and surfing, he has always been a waterman. Working for boat charters was a natural progression for him where he honed his craft for the ultimate customer experience. Now with a lifetime of experience, Cody has struck out on his own with Blue Ocean Adventure Tours. All the crew members of Blue Ocean Adventure Tours were hand selected because they all share the same passion for the ocean and adventure. That process guarantees you to have an experience on our tour that will be chock-full of memories you will cherish for a lifetime. Our Captains are trained and experienced. Our craft is well maintained and cared for. We have daily check lists for the Captain and Crew, including safety procedures. Each craft has water safety equipment and radio communications equipment. Disclaimer: Blue Ocean will not allow any persons with pre-existing physical injuries or conditions, other conditions, INCLUDING PREGNANT women as the activities may pose an additional danger to such.